A recent Pew Research study found that at least 25% of people admit to posting anonymous comments online. A professor at the University of Houston found, from private research, anonymity contributes to less civil discourse. This same professor found that while observing newspapers for about a year and a half that 53 percent of comments were uncivil in papers that allowed anonymity. That percentage dropped to 29 percent when newspapers required names or links to Facebook accounts. This further strengthens a study in 2013 that found writing and reading online rants was unhealthy and the people that do it are generally angrier. Anonymity makes it easier for some people to post things they normally might not. The reason given is that most people, hiding behind the shroud of anonymity, think this gives them unlimited rights to abuse others with no penalty for doing so. Most abusive posters think there is no legal recourse against them since they hide behind the computer screen with no way to find them (which is far from the truth). 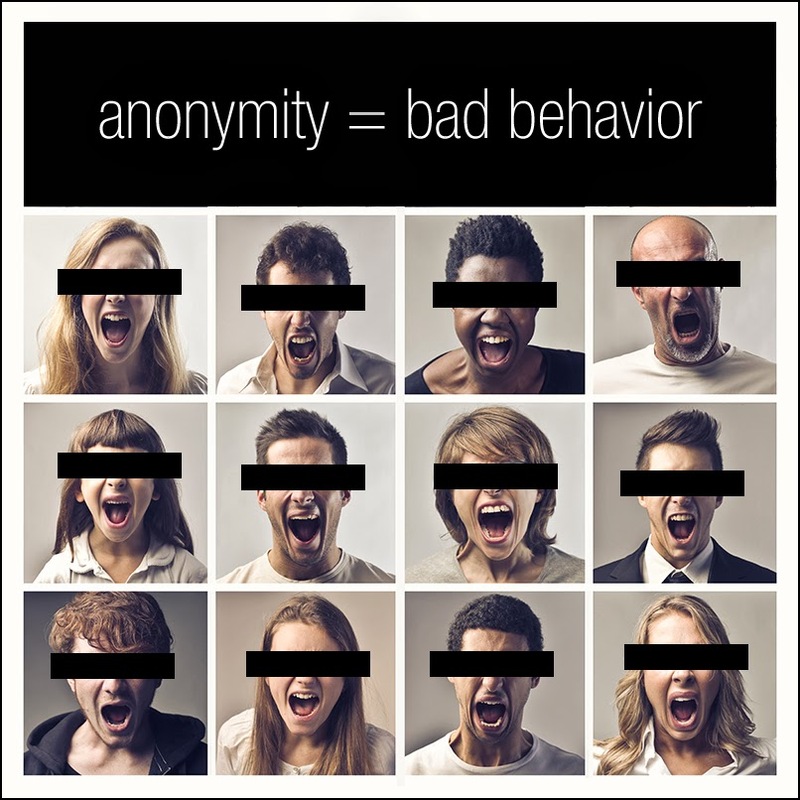 I have to say the anonymity problem, on forums, blogs, newspapers, websites and other media outlets, has been going on for as long as there have been interaction between people on the internet. My experience on the internet began in 1990. I barely knew how to turn on a computer back then. But, after participating on some sports forums on the online service Prodigy, I was shocked at the manner in which people treated each other. I have had people threaten to beat the hell out of me, call me names I wouldn't repeat here and tell me I had to be the dumbest SOB on the planet. I'm sure there are others who have experienced the same thing. I have always referred to those people as "Internet Cowboys." They are rough, tough and ready to rumble....behind the computer screen. I have told these people countless times they would never repeat these things to my face or anyone else because face to face is totally different. Face to face you are held accountable for your actions. Invaribly the reply is always they would most certainly say those things to my face. I somehow doubt that. I say it not because I'm so rough and tough myself. I say it because most people lose touch with reality behind the cloak of anonymity and the safe confines at home with their computer. It changes the most mild mannered individual into a fire-breathing dragon. I've seen it too many times. So, I have to say the Pew Research and the research by the professor at the University of Houston are a little late to the party. This has been going on for decades and will continue for decades more. I used to have problems with a lawyer on this blog (back when people actually used to comment). I made the mistake of making an assumption about a legal matter. He displayed why so many people distrust and hate lawyers. This lawyer tried to be condescending and was quite rude. I also lost my temper and blasted him. I hated myself afterward for stooping to his level. It's easy to do, losing your temper on the internet. This is an area that needs further study. Why do people get so angry on internet message boards? It's a worthwhile area of research. Anonymity has a lot to do with it. But, that doesn't answer the anger issue. It seems Internet Cowboys will continue to roam the plains of the internet indefinitely. Giddy-up!